From the Script Player panel. Note: The Script Panel panel can be launched from the Script Player item of the Record menu. Confirmation that the Current Page will be Cleared. 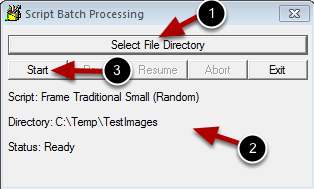 When doing batch processing your currently selected page will be cleared. Confirm with by selecting OK button or abort with the Cancel button. Click the Select File Directory button to select the folder where the image files reside. Press the Start button to start the batch processing. Before the batch processing will start you will receive one more confirmation dialog giving you the opportunity to abort if needed. Every image file will be processed in the selected folder if you choose to continue.